Your beliefs define who you are AND what you get out of life! what beliefs to change and how to change them. Dr. Nick Hall gives you the answers you need… and must have! Make no mistake, your beliefs define who you are AND what you get out of life! Your beliefs control your health, your financial position, your emotions, the quality of your relationships, and even your education. Because of this, it’s important to understand what your beliefs are and how they impact each area of your life. You see, most people live their lives based on “missing pieces,” because sometimes we form our beliefs based on only a fragment of the information available to us. And if these beliefs aren't accurate, they can hurt us for the rest of our lives unless we identify and change them. You see, the more information you have, the more options you have in making an informed decision and in making sure your beliefs are taking you where you want to go in life. Nick Hall, Ph.D., will show you how to take control of your life by making sure your beliefs are in harmony with your lifestyle. The belief discovery process alone is exciting. But what really makes the process incredible are the proprietary techniques you can use to change your life in a powerful and permanent way that goes far beyond motivation. Rather, you'll learn to harness the power of your beliefs to change your life effortlessly, even if you've encountered significant problems in the past. By the end of this message, here’s my promise to you: You’ll know how to change your life without struggle, whether it relates to improving your health, your finances, your career, your relationships, your education, or even the quality of your leisure time. And it's guaranteed to work because you'll be approaching life from a completely different and more effective angle. Without warning, a healthy 28-year-old Philippine-American woman was crippled with aching joints. Her face became inflamed and discolored, especially when she went into the sunlight. Diagnosed with an autoimmune disease called lupus, she was given drugs to suppress her runaway immune system. But they didn't work. When her doctor recommended a more aggressive form of treatment using higher doses of the drug, she rejected that advice and returned to her native Philippines, where she sought the counsel of a local aspect healer. His treatment? He removed a curse that had been placed on her. When she returned to the U.S., she was evaluated by the same physician who made the original diagnosis - and was found to be free of all symptoms of lupus. There are two things remarkable about this case report. First, it was not published in the 'National Enquirer' or any of the tabloids, but rather in the conservative Journal of the American Medical Association. Second, neither the author of the paper, Dr. Richard Kirkpatrick, nor the editorial staff of the journal questioned whether the aspect healer succeeded where the practitioner of Western medicine had failed. Rather, the question posed at the end of the article was simply this: "By what mechanism had the aspect healer succeeded?" Did the aspect healer really rid the patient of lupus? He didn't use gene-splicing techniques to correct the mutation. All he did was remove a "curse" that had been placed on her. It was this woman's belief in the power of the curse that upset her biochemistry. Her lupus, a mild form in remission for most of her life, came to the surface as a result of her belief. This case serves as a perfect example of the power that an emotion-driven belief system can have in shifting the delicate balance between health and disease. Just as her belief in the curse gave rise to the symptoms, her belief in the powers of the ethnic healer removed those symptoms. This and other similar scientific research have proven that your physical health and emotional well-being are inextricably linked to your beliefs. Your beliefs not only shape your perception of the truth, they also have an impact on every aspect of your life - from how your cells function to how you function in relationships. The fact is your beliefs are blueprints that determine how your life will turn out. And if your beliefs are not consistent with the way you are living, your life will be filled with stress, health problems, and personal and professional disappointments. Say for example you have a goal of making a million dollars. If you were brought up with the belief that money is the root of all evil, chances are you'll sabotage your efforts in some way. All our lives, we set goals and make decisions about where we want to go. Yet all too often, we don't get there, no matter how many resolutions we make or how many seminars or programs we experience. It's time to stop and examine all those goals you've been setting and see if they are connected to your deepest beliefs and values. If they are not connected, you need to change either your beliefs or your goals, because only when your goals are in line with your beliefs will you be able to live the happy, enriched life you want to live. Sometimes you need to change your lifestyle - the place you work, the environment in which you live, or the relationship you're involved in. On the other hand, sometimes you need to change the belief - or at least take a closer look at it. Where did it come from? Is it your belief or someone else's? Is it helping you achieve your goals, or hurting your progress? Step by step, the audio program Change Your Beliefs, Change Your Life takes you through this powerful and life-transforming process. YES, I want to quickly and near-effortlessly change my life in a powerful and permanent way. Your life is like a software program. When new software is created, it frequently has bugs and doesn't work properly. Computer programmers use "debuggers" that find and fix problems in the software so it runs smoothly. In the same way, Change Your Beliefs, Change Your Life will act as your debugger so your life runs the way you want it to run. When you listen to the program, Dr. Nick Hall will show you how to recognize the impact your beliefs have on every area of your life. He'll show you how to recognize where any given belief comes from. Plus, you'll learn to understand how and why you internalized your beliefs so you can change them, if you want. You'll also learn to recognize those beliefs you've been suppressing or ignoring - beliefs that have become habits or beliefs that are preventing you from getting the most out of your life. Through Dr. Hall's Belief Challenge Process, you'll go through a series of steps in which you will identify and understand your beliefs. From there, you'll learn how to draw your own conclusions about whether your beliefs should be cherished or discarded. Once you've aligned your beliefs with your goals, your life will automatically go more smoothly. You'll discover that you really can be anything or do whatever you want. Your emotions will be completely balanced, and you will appreciate what you have and what you are doing. You'll be living a fulfilled and passionate life. You'll love your job. You'll value time spent with your family. And you'll master the art of enjoyment and be rich in every aspect of your life because you'll be living to your fullest potential. And once you get there, you'll understand the real significance of Dr. Hall and his research. Dr. Nick Hall recognized the power of beliefs early on in his life. He worked his way through college by wrestling alligators and milking rattlesnakes at the Black Hills Reptile Gardens in South Dakota. That was when he learned it was wrong to believe he was invincible - courtesy of a six-foot alligator that nearly ripped his hand off during a show. Professionally, Nick Hall is a psychoneuroimmunologist who has conducted pioneering research dealing with the interrelationships between emotions and health. He taught at medical schools for 25 years, where he also researched the links between the brain, behavior, and the immune system. His undergraduate training was in experimental psychology, and he also spent two years working for the Office of Naval Research training dolphins as part of a study of stress-related communication patterns. His research has been featured on 60 Minutes, Nova, Nightline, and the Emmy Award winning television series, Healing the Mind, produced by Bill Moyers for PBS. Dr. Hall has been the recipient of two prestigious Research Scientist Development Awards, granted by the National Institutes of Health to only the top scientists in the United States. His training is as a scientist, and therefore he is a bit skeptical. But his non academic experiences have shown him that the way things should work in a laboratory is seldom the way they really work in the chaotic worlds we often find ourselves in. So don't worry. Change Your Beliefs, Change Your Life is not a stuffy, academic treatment of the subject of beliefs. In fact, one of the things Dr. Hall has learned about beliefs is that there is no simple 'cookie cutter' recipe for change…and there is no 'one size fits all' formula that works for everybody. What worked for you may have an entirely different result for someone else. That's why Dr. Hall's Belief Challenge Process works so well. It takes you through the process of uncovering beliefs that are unique to you, and then it has you answer a series of questions in the context of how they affect your relationship with yourself, your family, your business associates, and your neighbors, as well as the community at large. From there, you will be empowered to make decisions about your beliefs in a way that affects you and your life more powerfully than any cookie cutter formula can. Best of all, the program doesn't tell you which decisions or changes are the right ones. Instead, it helps you examine your life more openly and helps you decide for yourself which choices are best for you in your own unique situation. As you go through the program, you'll discover five categories of beliefs. Your core beliefs, for example, are your deepest convictions, and they can impact your life and death decisions. Problems arise when there's a mismatch between your belief-driven behavior and the environment in which you find yourself. Your core beliefs are deeply connected to your emotional brain, and they strongly influence your behavior. In fact, all your beliefs influence you strongly, whether they're core beliefs, cultural beliefs, hand-me-down beliefs, advertised beliefs, or biological beliefs. For example, when Dr. Hall was seven years old, he arrived home from school one day, devastated because he had failed an important math exam. The school he attended in England was very strict, and he had already been caned across the hand with a bamboo stick. He was an emotional wreck. When he arrived home, a relative consoled him by saying, "Don't worry about it. No one in our family has ever done well in math." From that point on, Dr. Hall never worked hard at math, and he only did enough to keep from getting caned. He accepted the hand-me-down belief that he was bad at math. It was only when he was forced to take statistics and advanced statistics in graduate school that he realized that a good instructor can make math fun and that he actually was good at math. But it took him over a decade to realize the belief that he was bad at math was not worth keeping. In a similar fashion, perhaps you may have heard of the benefits of boosting your immune system with herbal products such as Echinacea, goldenseal, garlic, green tea, etc. It's a strong advertised belief that boosting the immune system is the magic solution to health problems. But did you know that too much immunity is what characterizes people with multiple sclerosis, rheumatoid arthritis, and severe allergies? In fact, there are many cases in which boosting the immune system can be very dangerous. Change Your Beliefs, Change Your Life will help you examine the full spectrum of beliefs you encounter every day of your life. Then it will help you navigate through them so you accomplish more and feel better than you ever have before. Do you know people who go to seminar after seminar, read self-help books, and obediently complete audio programs, but can't seem to put it all together to make the necessary changes? Do you know people who even if they change jobs, still aren't happy? Or who might seem happy for a short time but the same problems seem to resurface at work and at home and with money? In every case, their actions, the way they live, the jobs they work at, are not congruent with their core beliefs. And because their beliefs are in conflict with their lifestyle, it affects their emotional state in ways that are highly detrimental to their physical and mental health. It affects how they feel about themselves, the way they eat, whether or not they exercise, what they do for a living, the quality of their family life, and how they plan for the future. Change Your Beliefs, Change Your Life solves these challenges once and for all, not by providing action formulas, but by helping people get to the bottom of what really drives them in life, and by making sure every aspect of their personality works together in harmony. If you have any inner conflicts, stress, mood swings, or personal challenges in your life, Change Your Beliefs, Change Your Life will help you bring everything back in harmony again. The six audiocassettes and workbook will show you how to take control of your beliefs so you can live the life you've always wanted to live. The booklet entitled, "Your Body As a Laboratory" will help you read your body's signals more accurately to determine what changes you need to make. Once you experience Change Your Beliefs, Change Your Life, you'll realize personal change doesn't have to be difficult. Instead, it will become an enjoyable adventure. P.S. Change Your Beliefs, Change Your Life will help you get past any beliefs that may be holding you back, no matter where they came from. Then it will show you how to create new beliefs that are in line with your highest values, so you can live your life to its fullest potential - on your own terms and by your own rules. P.P.S. Other people can't make you believe something; they simply provide the information you use to create the belief. That's why you - and only you - can change a belief that might be keeping you from achieving the quality of life you are seeking. You don't have to wait. Begin the process right now by identifying an area of life you would like to change, and then using this program to change it! How your beliefs influence your mind, your body, your relationships, your self-worth, your sleep, and even your financial decisions. How to connect your goals and objectives to your beliefs in such a way that you take the strides you need to achieve them. How to recognize when your beliefs are in conflict with the way you are living your life, and how to resolve any inconsistencies. How stress affects your life, and how you can develop a healthy response to stressful situations. How to overcome unhealthy belief systems that work against you. How your beliefs can improve your memory and immune system. How your beliefs can give you better control over your emotions. How to get out of ruts and overcome the fear of change. This scientific breakthrough makes personal change easy. The surest way to transform your body, your mind, and your life is by using Dr. Nick Hall's unique "Belief Challenge" techniques to change your life in a powerful and permanent way that goes far beyond motivation. I want to quickly and near-effortlessly change my life in a powerful and permanent way. 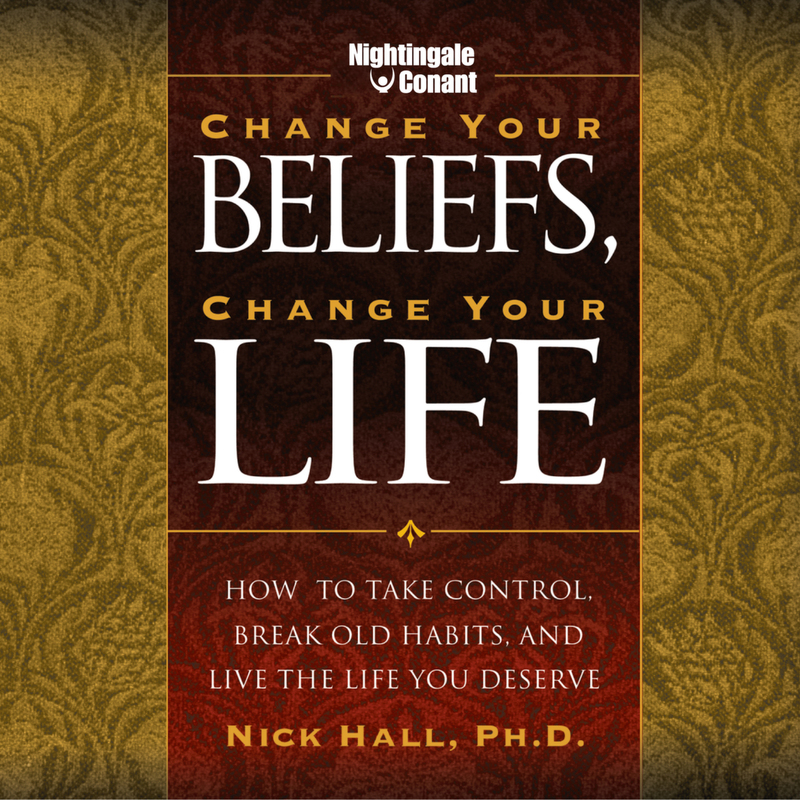 Please send me Nick Hall's audio program Change Your Beliefs, Change Your Life, at the special price below. - I can select one of two ways of ordering.